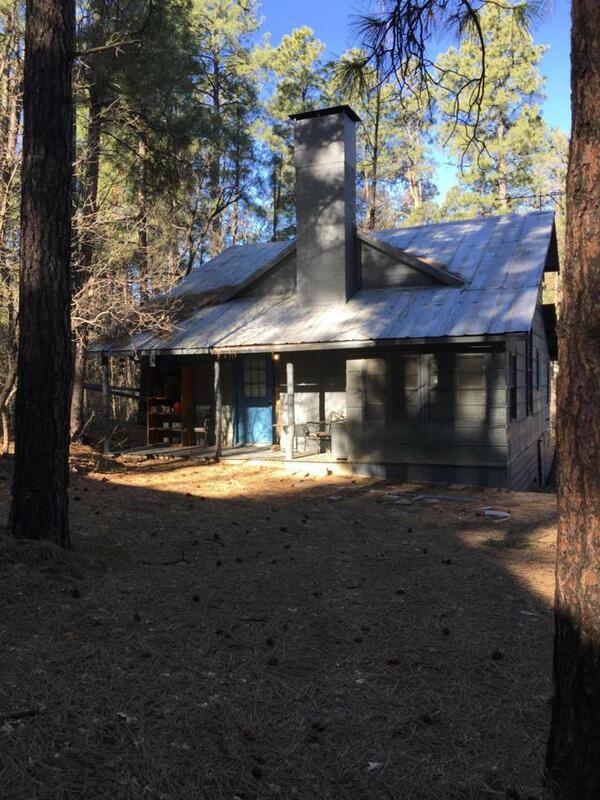 Take a step back in time to enjoy your mountain cabin, known as the Stapley House among the towering pines in Prescott Arizona.This cozy, historic cabin in the forest area known as Groom Creek, was originally built in 1940 and remodeled to provide more modern yet rustic country living. Easy access, rural feel and only minutes to Prescott.....and approx a mile to the National Forest.The interior has big windows to view the outdoors, a large kitchen, dining area, living area, pellet stove, and plenty of storage space. A large, full bath is on the lower level of the cabin along with a small downstairs bedroom. Upstairs is a loft/bedroom that runs the width of the home.Outdoors you have your own back yard with plenty of open space to enjoy gardening, visiting, or BBQ's.The cabin has a large parking area for your vehicles and toys. Plus there are two sturdy sheds for additional storage needs. A short distance down the road is a park that has been named in memory of "Big George Stapley", the park is shared by the community and can be reserved for parties. A quiet location where you can hear the birds singing and the gentle rustle of the leaves in the afternoon breeze. Year-round access off of a paved road makes this spot easy to enjoy all 4 seasons. The community maintains the interior dirt roads with your annual HOA fee. Also included are the electric, water making this an easy property to own. The area of Groom Creek is minutes to National Forest where hiking, horseback riding, and jeeping are enjoyed by all. The downtown Prescott area is a year-round destination with activities, parades and festivals to meet the entertainment needs of everyone. A few min walk to Prescott national forest and cabin sits at an elevation of 6300 ft. Listing provided courtesy of Robert Killian of United Country Az Country Re.